attic ventilation Archives - Page 2 of 2 - Charles Buell Inspections Inc. 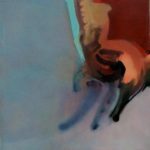 I have blogged about this particular issue in the past. This defect is not common in New Construction. It usually occurs in homes that have been re-roofed. I am talking about compromised attic venting due to “opposing” systems being installed. Older gable roofed homes typically had gable vents. 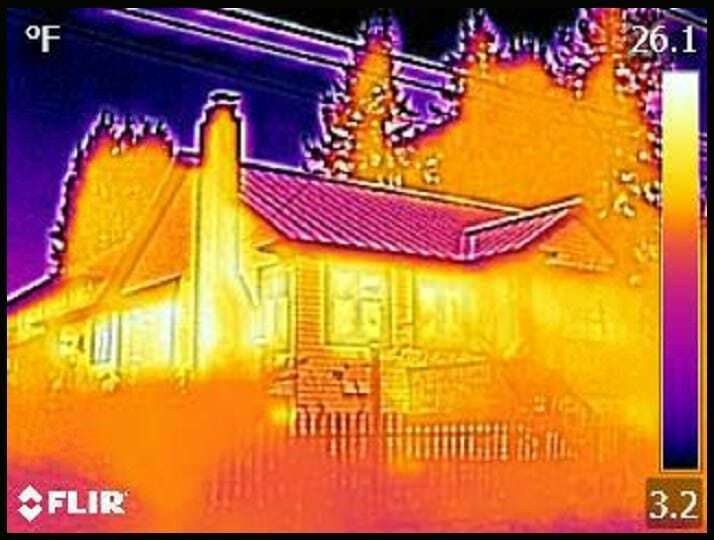 Historically, as we came to understand how venting works, and came to understand the problems associated with inadequately vented attics and roof structures, we moved away from the use of gable vents. Gable venting relies on movement through the vents from one end of the attic to the other to change the air in the attic—and hopefully to carry any moisture that has entered the attic with it. 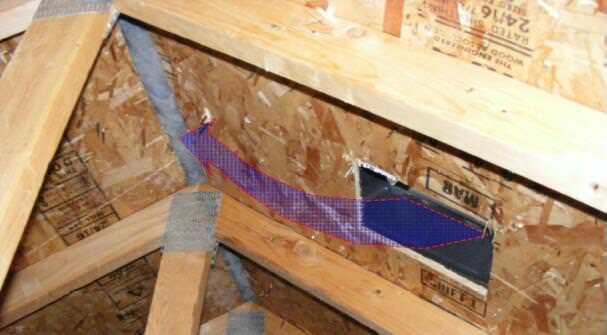 While in some cases this can be adequate, it often left areas of the attic “under-ventilated” due to poor circulation. This system was also subject to poor venting depending on the house’s orientation to the prevailing wind direction. The next approach was to have soffit vents that circulated air up to roof vents located near the ridge of the roof. This was better but could still be affected by wind direction and in some cases the vents could be buried in snow drifting across the ridge. By far the best method of venting the attic space is to have soffit vents that work in conjunction with continuous type ridge vents. As wind moves across the ridge from any direction it acts to pull air out of the attic. I discussed this principle previously in, Ridge Vents–venting of roofs and attics. So how does improper venting happen in New Construction? 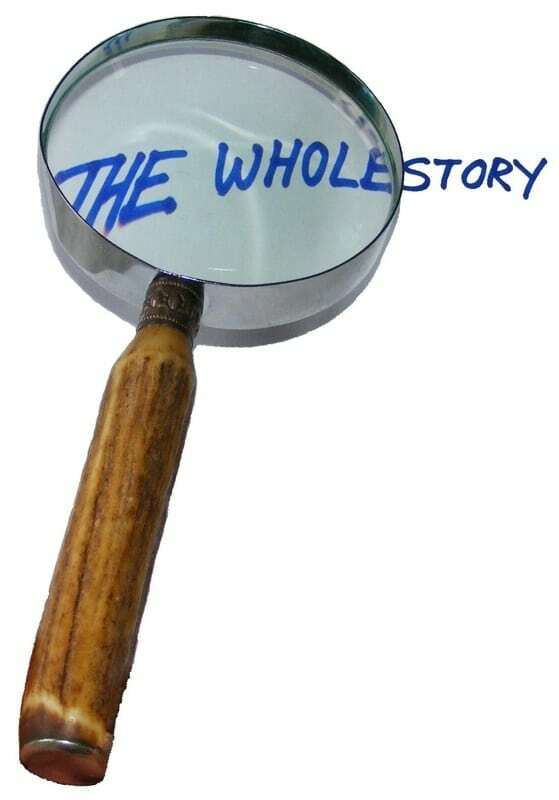 It is easier to see how it happens in old. For example: the gable vents are already there—-and no one thinks to cover them up. The roof vents are already there—-and it is easier to put another roof vent over the hole than it is to patch the hole and then properly patch the roof. Perhaps the framers were just used to cutting the holes but the roofers where trying to do better? Lack of communication perhaps? Whatever the reasons, it shows a serious flaw in someone’s understanding of basic building science. 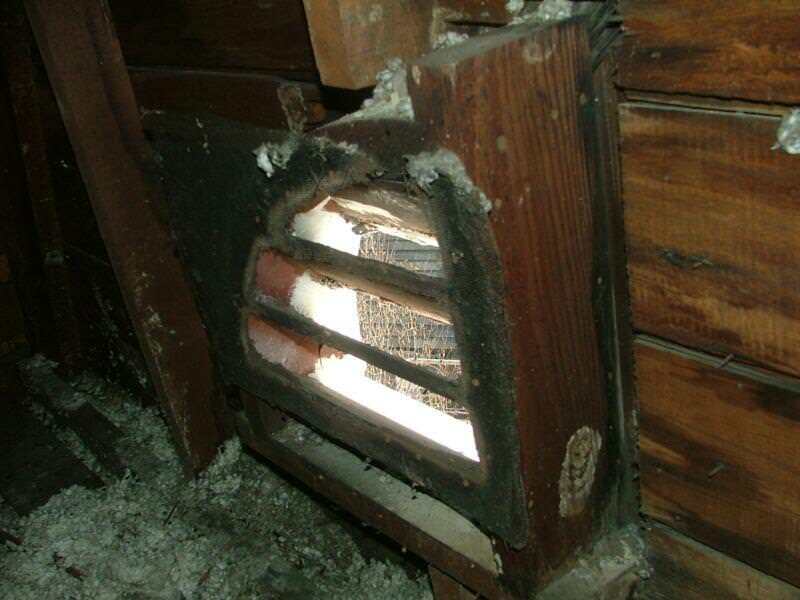 The following picture, from inside the attic, shows how the air is likely to flow to the continuous-type roof vent—-pulling little air from the soffit vents. Most older homes relied on gable vents to provide ventilation of the attic. Modern homes sometimes have them as well. Proper ventilation of attics could be fodder for an endless number of blog posts, but with this one I am just going to discuss Gable Vents. This post is simply about proper maintenance of gable vents if you do have them. These vents generally have screens in them that can be damaged by birds or simply rust away over time. Obviously if there are holes in the screens, birds, bats and bees (and even rats and mice) can get into the attic. Sometimes the presence of the screens and their condition can be seen from the exterior of the home. 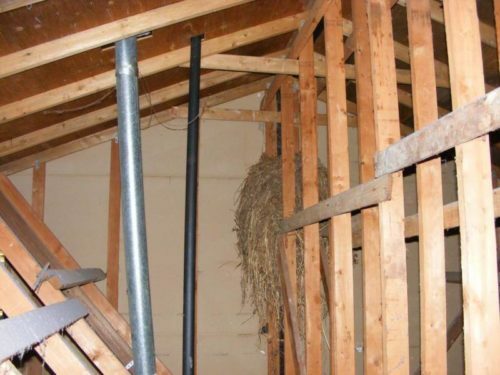 Most of the time inspection from inside the attic is required and is another good reason why the home inspector should traverse the attic during the inspection. 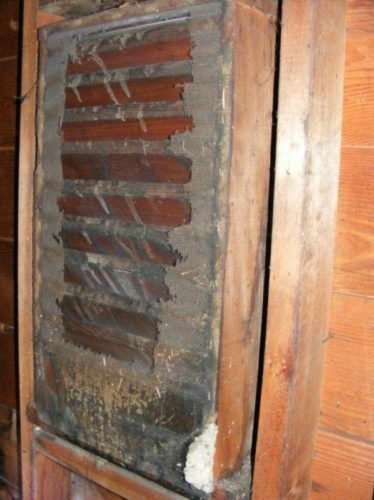 Here are a couple of pictures that show typical louvered type gable vents with missing rusted out screens. In the next picture one can see where birds have created a huge hay stack of nesting materials under the a gable vent with no screen. 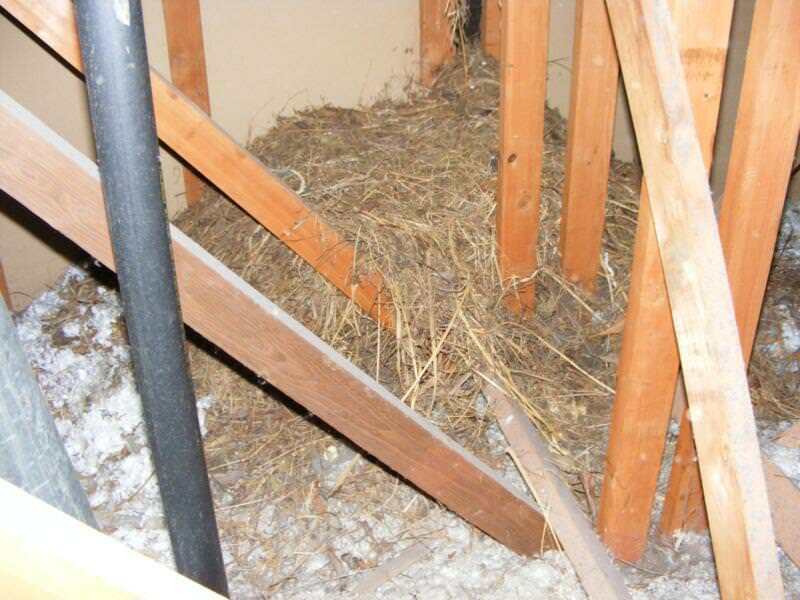 Under the upper nest there was additional nesting materials All of these nesting materials can represent health and fire safety hazards and should not be allowed to accumulate in the attic. It is important to maintain these screens to keep vermin out of the attic.